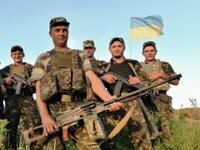 Donbas militants conducted 78 attacks on Ukrainian army positions on Monday, including by use of 122mm artillery and 120mm mortars, the press center of the Anti-Terrorist Operation (ATO) headquarters wrote on Facebook on Tuesday morning. "The enemy fired 122mm artillery systems near the village of Myronivsky and Pisky in Donetsk region. Besides, 120mm mortars were used near the villages of Mayorsk, Nyznye Lozove, Zaitseve, Luhanske and the town of Avdiyivka," it said. According to the press center, 82mm mortars shelled Avdiyivka, the villages of Kamyanka, Pisky, Zaitseve, Troyitske, Opytne, and Nevelske. Grenade launchers, large-caliber machine-guns, an anti-aircraft gun and an infantry combat vehicle attacked Ukrainian army positions near Novhorodske, it said. In the Mariupol sector, illegal armed formations opened 120mm mortar fire on Ukrainian army positions near the towns of Maryinka and Krasnohorivka, and the village of Starohnativka. Militants used 82mm mortars, grenade launchers and small arms in the village of Vodiane, and lobbed shells of grenade launchers, large-caliber machineguns and weapons of armored vehicles into Maryinka, the report said. In the Luhansk sector, the enemy's 120mm mortars shelled Ukrainian army fortifications in the village of Krymske, Novo-Oleksandrivka and Troyitske, and 82mm mortars, grenade launchers and large-caliber machineguns were used near the village of Stanytsia Luhanska, the report said. According to the press center, 34 out of the78 shelling incidents occurred in the Donetsk sector, 22 in the Mariupol sector, and 13 in the Luhansk sector.